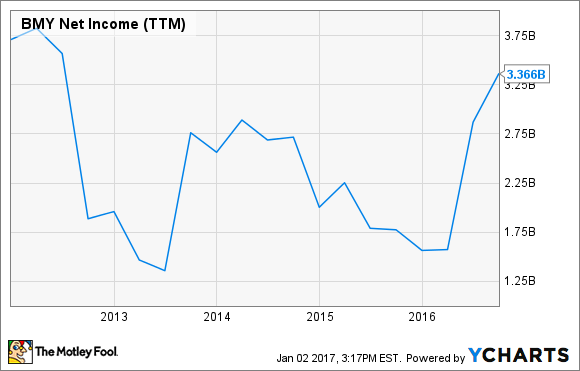 Can Bristol-Myers Squibb grow earnings enough to keep its dividend payments flowing? If there has been one thing to love about Bristol-Myers Squibb (NYSE:BMY) year in and year out, it's been the big drugmaker's dividend. With a current yield of 2.67%, investors still have reason to show the love. But there is something that might seem scary to some investors -- the company's ability to keep the dividends flowing at current levels. Are those fears warranted? Bristol-Myers Squibb currently uses more than three-quarters of its earnings to fund shareholder dividends. Is that good? No, but it could be worse. In fact, it has been worse in the recent past. BMY payout ratio (TTM) data by YCharts. 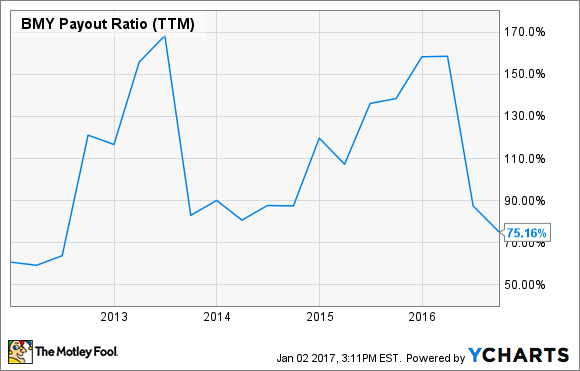 Over the last five years, Bristol-Myers Squibb's dividend payout ratio has experienced wild swings. This is a direct result of similarly large fluctuations in the company's earnings. BMY net income (TTM) data by YCharts. While Bristol-Myers Squibb's earnings were gyrating up and down, the drugmaker continued to steadily increase its dividend payments. Can dividends keep going up while earnings rise and fall with no clear trajectory? Not indefinitely. The reality is that Bristol-Myers Squibb isn't paying its dividends solely from earnings now. If we look at the company's cash flow activity from the first three quarters of 2016, Bristol didn't have enough earnings to fully cover its dividend. Data source: Bristol-Myers Squibb 10-Q. Chart by author. Bristol-Myers Squibb's net earnings of over $3.6 billion in the first three quarters of 2016 were whittled down significantly by several factors, including taxes, changes in accounts receivable, and a big divestiture impact. This left the company with a little over $1.4 billion in net cash provided by operating activities. Dividend payments in the first three quarters of 2016 cost roughly $1.9 billion. Bristol also repurchased $231 million of stock during this period. While the company borrowed some and issued $144 million of common stock, its net cash used in financing activities was still over $1.8 billion -- primarily due to its dividend. To cover the dividend payments, Bristol-Myers Squibb had to generate additional cash. The company did so mainly by selling marketable securities and by divesting assets. The biggest divestiture was the sale of its HIV pipeline program to Viiv Healthcare, a joint venture owned by Pfizer and GlaxoSmithKline. Can Bristol-Myers Squibb continue to fund its dividend payments by selling off its investments and assets? Again, not indefinitely. Should investors be afraid that Bristol-Myers Squibb's dividend could be in jeopardy? I don't think so, but it depends largely on how well Opdivo performs. Sales for the cancer drug are soaring. In the first three quarters of 2016, Opdivo generated $2.46 billion in revenue. Peak sales for the drug at one point topped $13 billion. Now, though, industry observers aren't quite as optimistic. That's because Opdivo disappointed in a late-stage clinical study evaluating the drug as a first-line treatment of advanced non-small cell lung cancer. Merck, on the other hand, saw its Keytruda post glowing results in a late-stage study for the indication. Wall Street analysts now think that Keytruda will be a bigger winner than previously projected, while Opdivo's peak sales estimates were revised downward to the tune of roughly $3 billion. Even with the lower estimate for Opdivo, Bristol-Myers Squibb should experience solid earnings growth over the next several years. The company thinks that it will be able to expand indications for Opdivo by combining it with other drugs. If Bristol is right (and I suspect it is), investors should be able to keep on loving the drugmaker's dividend for years to come.